It’s no secret that I love unusual names. 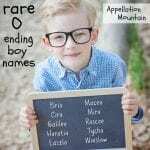 I’ve written before In Defense of Atlas and Apple: Ten Reasons Unusual Names Aren’t a Problem, and I haven’t changed my mind. 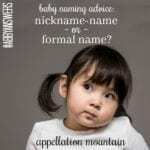 But I do have my hesitations, and a recent exchange with the mom of a very unusually named child got me thinking: what are the downsides to having a genuinely uncommon name? 10. You’ll stand out in a crowd. Waaaay out. I once heard from a mom blogger concerned that I’d shared her child’s very unusual name here. I removed the reference, but it is a raindrop in the ocean. An unusual name means you’ll be a snap to find on Facebook, in a Google search, on archives that have yet to be imagined. It’s always been true if your surname is unusual. For some, that’s a bonus. But if privacy is important, you’re better off with a more common given name. The challenge is, of course, that many parents want a distinctive name when they’re expecting, and will only consider the implications of being the only Gillespie or Sonata later. 9. Prepare to be misunderstood. One of my long-time favorites was Sidonie, an obscure French feminine appellation from a medieval saint’s name. But can you imagine introducing yourself as Sidonie? Despite the three-syllable pronunciation, you’d likely spend your days answering to Sidney and Cindy. Of course, you can repeat yourself and explain your name. But that might get old. Emma, I’d wager, is rarely mangled. 7. Do you have a thick skin, or wear rose-colored glasses? 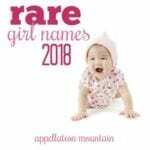 Unusual names provoke unusual responses, ranging from parents impressed that you used something so stylish and daring, to those who truly believe little Nikita Soren is in for a lifetime of mockery thanks to your senseless choice. Nancy’s sweater analogy is particularly useful here. I guarantee you that not everyone thinks Clio is a great name – they just haven’t got a clue what else to say. 6. Speaking of thick skin, it’s not standard-issue for children. If you’re a professional songwriter and musician, your kid Lyric might find her name as ordinary as Sarah, especially if her school community is filled with other artists’ kids. But even if it works for you, it may not work for your kiddo. 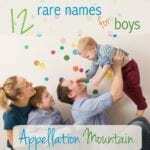 Of course, the opposite is also true – some kids hate sharing their Top Ten name – so this isn’t a compelling reason to play it safe. It’s just another factor to consider. 5. The impact of a fictional character or headline-maker who shares their name is considerable. This is my main argument for not naming your daughter Kimora. While she’s doing well, it’s one thing. But there’s nothing worse than sharing a name with a celebrity or elected official who is much in the spotlight for the wrong reasons. You can’t control it, of course. But if the scandal-plagued celeb has a fairly ordinary name – Bill or Michael – the association won’t stick. Now try Tiger or Kobe. Imagine you inventively named your son Tiger before Woods went pro. Your sixteen year old is mightily annoyed every time he’s asked if he likes golf. 4. Virtue and other noun names suggest particular pitfalls. Grace might be clumsy, but she’s one in a crowd. It’s more exceptional when your Serenade can’t sing, or Everest turns out to be short for his age. 3. Nicknames present their own challenges. I long assumed that my friend Andi was Andrea, only to discover it was short for Andromeda. While choosing an unusual name with a common short form is one way to soften the impact of #5, it isn’t without problems. It almost intensifies the impact of the real name. 2. Gender bending. After once introducing my son as Alexei, the other parent – our boys were playing with monster trucks on a playground – said to me, baffled, “Oh, I thought he was a boy.” Even when the name is legitimately masculine or feminine, and your child is of the corresponding gender, unfamiliarity can lead people to stumble. 1. You’ll tell the story of the name again and again. 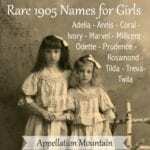 If you’ve chosen an unusual name for the right reasons – for a personal meaning, in honor of literary or notable namesakes, to remember a loved one or emphasize cultural ties – this is a tiny thrill, a chance to explain why you named your daughter Svetlana after her Russian grandmother, or how you’ve always admired Atticus Finch. On balance, I think the reasons to hesitate before using an unusual name are just that – things to consider before you proceed. And yet, this site often attracts angry emails and comments from parents who don’t want to hear anything other than glowing words about their kids’ names, from Aura to Zaphyn. It makes me think that the moment of hesitation should sometimes be longer. Having a name like Tegan was always going to get me noticed and there are definite downsides to having an unusual name but with every down side is a good side to it. I am never forgotten which if you aren’t a cray person is always good. I have more people saying what a nice name it is rather than its weird. I have a lovely story as to why i was called it and its nice to know my parents put so much thought into my name. The only downsides is spelling my name all the time and people thinking i am possibly a man but this happens less and less and as you grow up you realise that having something unique about you works more to your advantage than your disadvantage. I think working out if a name will be abbreviated and what it might be bullied about is the only things to worry about. i won’t share what we plan to call our children as we would like to keep them unusual but all my children will have reasons for their names and unusual ones as i think your name is your first gift to your child. Let me give you a couple more. I know it doesn’t seem much to an adult, but to a kid sometimes being the only one doesn’t feel so great. I can appreciate being the only Dellitt now, but at age 8 I just wanted to be Lisa. I wanted personalized stuff with my name on it, the kind they have in drugstores or wherever. I wanted one person who had known me for 10-20 years to be able to say AND spell my name correctly – it was usually only one or the other, not both. Usually they spent the whole time they knew me writing anything but my name and saying it anyway but right. I truly hated my name growing up, even if it was grandma’s name and I loved her. Numbers 2, 5, 6, and 10 would be reasons for me to pause. But otherwise most of these would not be a big deal to me, so I guess I’m good to go with my favorite oddities when the time comes! I know what you’re saying with number ten! I have met one other person with my name, and heard whispers of a few others (My real name’s not Kaye). I absolutely love my name, and would hate to be something heard every day, like Ashley or Taylor, but it does have it’s downsides. A few google searches can find me, especially if you have my last name too. There have been situations that made me nervious about being that easily located, such as once in a store when some of my friends and I were acosted by an overly friendly “gentleman.” He asked too many questions, but did not get my real name! That’s why, if in doubt, I go by Kaye (my middle name). Great post, Abby! Regarding your #7: We chose a name for our son that isn’t even that unusual, but it’s not commonly heard among the people I interact with. When Julius Arthur was a newborn, I could tell most people didn’t really like it. They’d say something like, “Wow! That’s a really big name for such a little guy.” I even had one woman (the mother of a student at my school) shudder and say, “Ugh.” Now that he’s 9 months old and has more of a personality, I think the name fits him better — and the reactions I get, while still sometimes surprised, seem a lot more genuinely favorable. But still, I’d rather get the occasional “Ugh” than the constant, “Oh, that’s so cute! My (cousin, sister, niece, friend) named her son that.” I’m so glad we didn’t pick Henry or Elliot because I’ve been meeting a lot more of those since our son was born. It did take me about four months or so to be convinced we had picked the right name. My brother’s name is Koby and he was 5 years old when Kobe Bryant entered the basketball scene, but he still always gets asked if he is named after the famed baller. Im sure he is sick of it, but he does enjoy his name because most other kids his age are Zach or Cody .. its the much yonger generation that is Kobe or Colby. I agree, it should be a “five day pause” not just ” a moment”! I have this conversation with just about every new person I meet. I love my name and can’t imagine being named anything else, but I’m the only one I’ve ever met! I grew up in a small rural town and thankfully had a common middle and last name. Thankfully there haven’t been any celebrities with my name yet, either. Both of my children have top 10 names with unexpected nicknames- so best of both worlds, I guess. I think “standing” out in the crowd is a very good point. I have an unusual first name and last name, I wouldn’t change my name for the world, but I am a reserved person and it is incredibly easy to find me on facebook or google. Still, I think I would use an unusual name for my child, anyway. I LOVE your name. My great grandmother was named Sebastianna (she married a Sebastianno) and my middle name is Ann, which was her nickname. I’ve always said I wanted to name my daughter Sebastianna. […] fills in the gap between a short given name and not-so-long last name, or vice versa.